When it comes down to it, hunting is one of mankind’s most primal activities. Not to discount the contributions of a growing number of female sportsman, but for thousands of years providing raw meat has mostly been the duty of men. So it’s no wonder that returning home from a tough and prolonged hunt and slapping a dead carcass on the table has a certain positive effect on a guy’s sense of manliness. How do we know this for sure? UCSB anthropologist Benjamin Trumble collected saliva samples from the Tsimane tribe of hunter-gatherers in Bolivia and measured levels of their hormones before, during and after hunting. It essentially shows the longer and tougher the hunt, the better a man might be in the bedroom, or at least caring for his family and doing nice things around the house. The study published in the Royal Society’s British Letters specifically found the more testosterone levels rose during the hunt, or day at the office so to speak, the greater levels of oxytocin – the so-called “love hormone” – was released upon the man’s return home. 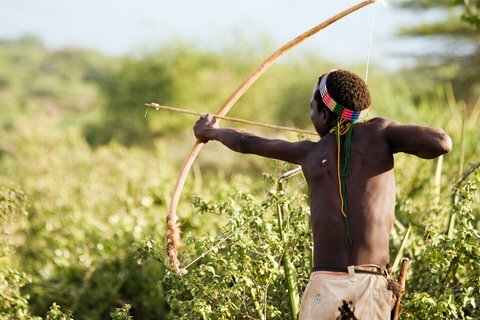 In the past, studies have looked at the hormone effects on men who engage in traditionally male activity like hunting wild animals, competing in sports or even pack mentalities around the office and found they increased testosterone. This is one of the first studies to look at the familial and nurturing effects of hunting, reports the Los Angeles Times. So for all those hunters out there late for dinner, this might be something to bring up. next articleHow Fish See: Does Color Really Matter?